According to Martin Parr (born 1952) the Photobook is the ‘supreme platform' for photographers to disseminate their work to a mass audience. The increase in self-publishing platforms, specific prizes for photobooks, and a growing body of collectors is testament to the growth of the photobook genre within photographic practice. 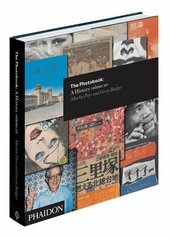 Join us to mark the launch of The Photobook: A History, Volume III and hear Martin Parr and co author Gerry Badger in conversation with Simon Baker, Curator of photography and international art at Tate, and Hannah Watson of Trolley Books. Martin's work bridges the divide between art and documentary photography. His studies of the idiosyncrasies of mass culture and consumerism around the world, his innovative imagery and his prolific output have placed him firmly at the forefront of contemporary art. His recent and upcoming publications include The Non-Conformists (2013) and Martin Parr 2nd Edition (May 2014). A member of the international photo agency Magnum, Parr is an avid collector of books and a world authority on the photobook. Hannah is the Director of Trolley Books and the gallery TJ Boulting. Founded in 2001, Trolley Books are known predominantly for their photography titles, in particular unique stories in photojournalism, but also contemporary art and most recently fiction. Gerry is a photo historian, architect and critic. He regularly writes and lectures on photography and has curated a number of exhibitions. His published books include Collecting Photography (2003) and monographs on John Gossage and Stephen Shore, as well as Phaidon’s 55s on Chris Killip (2001) and Eugene Atget (2001). In 2007 he published The Genius of Photography, the book of the BBC television series of the same name, and in 2010 The Pleasures of Good Photographs, an anthology of essays that was awarded the 2011 Infinity Writers' Award from the International Center of Photography, New York.